When it comes to traffic safety, you commonly hear the three "E's": education, enforcement, and engineering. The officers with the Paducah Police Department spend a great deal of time enforcing traffic laws as they patrol the streets. Even though Paducah's population is approximately 25,000, the city is a hub of activity for the surrounding region. The Paducah Chamber of Commerce estimates Paducah's daytime population can exceed 100,000 people. This creates an increase in traffic and in collisions. In the following video, Paducah Police Captain Joseph Hayes discusses what drivers should do when an emergency vehicle is approaching. For a quick summary of facts and myths regarding traffic citations and collisions, read this Ask Paducah article from February 2017. In 2017, the department issued 4079 traffic citations ranging from speeding and red light violations to having no insurance and texting while driving. In 2016, the department issued 4983 traffic citations. An additional 4155 courtesy notices were issued as compared to the 3608 issued in 2016. 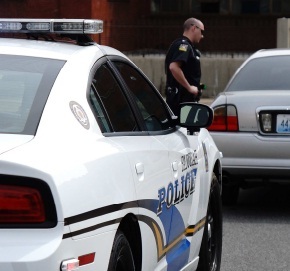 The Paducah Police Department does not collect the revenue generated by traffic citations. There were 423 parking tickets written in 2017 as compared to 703 in 2016 and 941 in 2015. Officers investigated 1737 vehicle collisions in 2017 as compared to the 1894 collisions in 2016 and the 1904 collisions in 2015. For 2017, 334 of the collisions resulted in injuries. In 2016, 375 of the collisions resulted in injuries to 589 people. Sadly, the number of people killed in motor vehicle collisions jumped from three in 2016 to six in 2017. The Paducah Police Department contributes to state-wide campaigns such as "Click It or Ticket". According to the National Highway Traffic Safety Institute, an estimated 85 percent of people used their seat belt in 2010. Seat belt use has decreased the number of traffic related fatalities. There were three fatalities related to traffic collisions in 2016 with eight fatalities in 2015.. In October 2012, the Paducah Police Department launched a three-person traffic unit to make our roadways more safe. In 2014, the unit was suspended due to manpower issues. When active, the Traffic Enforcement Unit spends its day focusing on enforcement, awareness, and education in Paducah's high-traffic and high-collision areas. In 2013, the Unit concentrated its efforts on areas of Hinkleville Road near Kentucky Oaks Mall; Lone Oak Road; Jackson Street; and North 3rd Street. The Unit's efforts in 2013 reduced collisions involving injuries by 19 percent and the number of people injured by ten percent. One of those Traffic Enforcement Unit's focus areas is the stretch of Hinkleville Road between Interstate 24 and Olivet Church Road. A study published by the Kentucky Transportation Cabinet in September 2012 indicates that the number of crashes on that stretch of roadway is higher than average when compared to similar roads. The Cabinet also reports that nearly 25,000 motorists travel that section of roadway daily. The following Paducah View episode (April 2013, 4:52 minutes) provides more information about the Traffic Enforcement Unit. The reduction in collisions allows officers to conduct more proactive policing. An average traffic collision can occupy from 42 minutes to more than 2.5 hours of an officer's time depending upon the damage and severity of the collision. 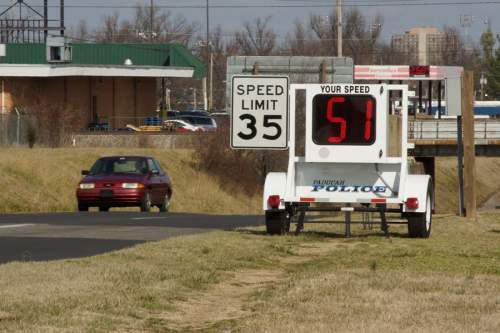 Using funds from a MetLife Foundation grant, the Paducah Police Department purchased a roadside speed trailer to help educate drivers. This speed trailer also gathers data. It has the ability to capture the speed of every vehicle that passes along with a time and date stamp. The information is used to determine if there is a need for enforcement action as well as the best time to deploy resources to the area. The Department also has made several presentations regarding the dangers of distracted driving and are trying to educate the public through the distribution of educational flyers. To learn more about the dangers of distracted driving, please watch the following three-minute video. The Paducah Police Department's Traffic Crash Reconstruction (TCR) Unit responds to all fatal traffic collisions as well as serious crashes that may result in a fatality. The TCR's responsibility is to determine if criminal charges are applicable. If so, the Unit investigates and helps in the prosecution of those cases which may involve felony or misdemeanor offenses. The TCR also helps document and preserve evidence that may later be used in civil proceedings. Also, the TCR investigations into causational factors help aid in the continuous research efforts underway by academics, government experts, and automotive engineers who are trying to make our automobiles and roadways safer. The Paducah Police Department is grateful for the grant funding that it receives from the State of Kentucky to conduct targeted traffic and DUI enforcement. With the grant funding, officers are able to conduct check points and receive training to better detect impaired driving. In 2016, the department made 214 arrests for Driving Under the Influence.